start with 5c at start and immue to 3/4 first round only. (Cost 50c) Includes priority entrance, immunity to 3/4 first round, and pre-gain! DO NOT leave group; membership serves as a receipt and as the ONLY proof of purchase. Transfer conditions apply. NO REFUNDS. This group is dedicated to my rescued cats IRL that have sadly passed away. Every winners will be listed on this badge forum to prove we don't scam. ƒ COST: 20c ADVANTAGE: Fast line IMMUNITY: From p2k and lose first round. FP costs 30c and gives you early entry to the game, immunity to 3/4 for the first round, as well as a sack to start. Permanent. Hell is what you make it. Ministry of Magic is the primary governing body of the magical community in many countries. Headed by the Ministresses/Minister for Magic, Ministry of Magic is responsible for regulating and enforcing laws for the magical community. To all of you, legendary people. 25c, start off with a sack and immune from 3/4 first round. 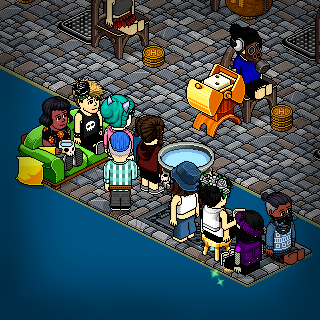 Founded in November 2018, the DEA is led by Habbo's most experienced agency veterans. Together, we will help create a better agency for all! We invite you to join us and experience what is truly a unique agency. Still The Same Just Another Name. This Group Badge Is Worth 40c † DYNOMITE BANZAI GIVEAWAY † Fast Pass. FP price varies depending on the game I'm hosting. Join this group if you like my bank games and for updates. Just a regular group. That Deal or No Deal! For everyone who enjoys and takes part in my my events. Big prizes on the line. this badge costs 500c. Only ownership is allowed to sell MOD Contact one of the owners to purchase. these are all the high rank members of [DCI] there role is to keep the base safe and secure! This badge is worth 40c. Taken in this room on 30 November 2018 and received 1 likes. Taken in this room on 3 November 2018 and received 3 likes. Taken in this room on 29 August 2018 and received 2 likes. Taken in this room on 1 October 2016 and received 1 likes. Taken in this room on 1 September 2016 and received 0 likes. Taken in this room on 29 August 2016 and received 0 likes.